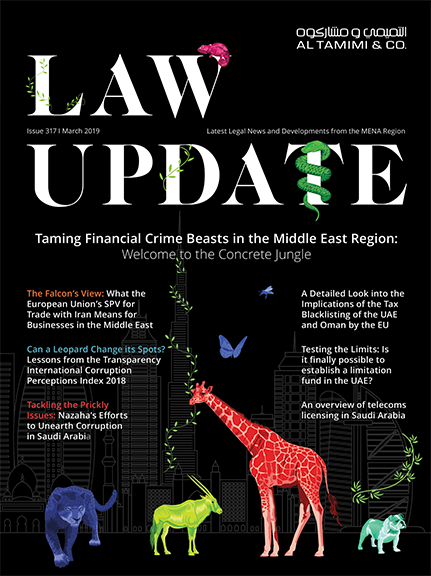 Commercial litigation is commonplace in Saudi Arabia, for instance as parties seek redress in the courts for unpaid debts or the resolution of contractual disputes. The obtaining of a legal judgment before or after appeal is not the end of the legal process in the Kingdom. A crucial part of the process is obtaining the swift enforcement of a judgment or other enforceable right so that a successful plaintiff can recover the money damages due to it. The Saudi Execution Law, enacted by Royal Decree No.M/53 dated 13.08.1433 AH corresponding to 3 July 2012 (‘the Execution Law’) and the Executive Regulations of the Execution Law issued pursuant to the Minister of Justice Circular No.13/T/4892 dated 17.04.1434 AH corresponding to 28 February 2013 (“the Execution Regulations”) regulate the enforcement of judgments of the Saudi Courts in Saudi Arabia. The purpose of this article is to provide an overview of some important aspects of the enforcement process in Saudi Arabia, which in some cases can avoid the need to go through the regular courts and provide a much quicker way to recover in respect of certain executable documents such as cheques and promissory notes. If a successful plaintiff has not been able to obtain a voluntary settlement from a defendant, it will be necessary to enforce a judgment or other legal right capable of execution through an application to the appropriate Saudi Execution Court for an execution order. Depending on the basis of the claim, it is usually necessary to produce written evidence to the Execution Court that the applicant has first tried to obtain voluntary settlement from the debtor. The execution order might, for example, involve the recovery of property or other assets subject to a judgment, the vacating of real property, or the confiscation or sale of funds or property. An application to the Execution Court for an execution order must comply first with Article 34 of the Execution Regulations and is dependent on the following main conditions and procedures. Other ordinary documents which are signed, sealed or fingerprinted by the issuer thereof and which are accepted by the Execution Judge as constituting the debtor’s declaration of their validity. The document will be accepted as an execution document unless objected to. If the debtor disputes the document, the Execution Judge shall order the debtor to sign a declaration of reasons for objection. The execution document submitted by the applicant must be for a specific amount, which is due and payable. It must not contradict the provisions of Sharia Law and must comply with the requirements of Article 9 of the Execution Regulations. If any objection is raised on commercial paper(such as a cheque), the written objection document shall be provided to the Execution Court along with the relevant commercial paper. The execution applicant shall, upon submission of his application to the court, present the original of any power of attorney. Finally, judgments may not be executed whilst any appeal is possible, unless they are subject to summary execution. If a company is seeking to recover payment under a cheque or similar instrument or where there is a clearly acknowledged debt or settlement agreement, it may be possible to enforce these directly through the Execution Court, which is a much quicker process than if it is necessary to obtain a judgment through the commercial courts in Saudi Arabia. The foreign country handles claims on a reciprocal basis. The debtor must be notified of the result of an application for an execution order in accordance with the Execution Regulations. The Execution Judge must provide reasons for any judgment, decision or order issued by him. If the Execution Judge dismisses the application for lack of jurisdiction, the provisions for judicial litigation contained in the Law of Procedure before the Sharia Courts and its executive regulations shall apply. The ruling is also subject to appeal under the Execution Regulations if the Execution Judge dismisses the application or suspends or postpones the execution or gives the debtor a period for payment or allows payment in installments. If the Execution Judge issues his execution order, the execution officer of the court shall prepare and sign the notice to be sent to the person subject to execution (the judgment debtor). The notice may be delivered in person. The Ministry of Justice uses electronic methods to notify a judgment debtor via text message if the phone is registered with the Absher mobile application system. Additionally, the judgment debtor may be notified when visiting any Ministry of Justice-related entity. If the judgment debtor approves the execution, the execution shall be recorded in the execution register as per Article 48 of the Execution Law. If the person subject to execution, raises an execution dispute, the execution judge will adjudicate. Depending on the nature of the dispute, the dispute may not stop the execution process, unless an order is made to cease execution. After notification of the execution order, the Execution Judge may order disclosure by the debtor, relevant authorities and third parties of enough of the debtor’s property to satisfy the obligation being enforced and also order the seizure of the debtor’s assets. If the judgment debtor is habitually slow in making payments (e.g. on their credit cards), the disclosure and distraint (seizure) of assets may be ordered before notifying him of the execution order. Property disclosure and seizure orders. As a practical step, it is recommended that the judgment creditor supplies as much information as possible about the debtor, his assets and location to the Execution Judge and, where appropriate, the police. Subject to specific exclusions, all the property of the debtor is subject to execution, whether such property is real estate, financial, commercial, intellectual property or any other type of property. Execution is implemented by the execution officers of the Execution Department. Such personal requirements of the debtor as the Execution Judge shall determine appropriate. If distraint is ordered, the distrainee may, at any stage of the process, pay the amount of the debt into the court’s account. Such deposit shall stop any further distraint. The attachment of movable property may be made by action or by order of the execution officer. Attachment of bank accounts and distraint of shares, financial securities, intellectual property and other relevant assets may be carried out through specified processes with the relevant Saudi institutions and regulatory authorities. The execution officer will prepare minutes of attachment containing information relating to the parties, the distrained property (including real estate) and other specified information. The attachment minutes are signed by the execution officer and the debtor, if present, and the security guard and any other person, such as a sales agent, involved in the attachment process as referred to in the minutes. The minutes of attachment are announced at the location where the execution data is published within five days from the date of distraint, and the announcement is deemed notice to all those concerned with the distrained property. One or more bank accounts shall be opened in the name of the Execution Court where the proceeds of execution can be deposited and withdrawn. In certain cases where a debtor has no fixed place of residence in Saudi Arabia or if there is proof that a creditor’s assets may disappear or be dissipated, a person may apply as part of Court proceedings (before issue of a judgment) for a precautionary attachment on certain assets of a debtor. Such application must be supported by a guarantee to cover losses that the distrainee may incur if the person levying distraint is found not to have the right to make such an application. An application for precautionary attachment is subject to all the same procedures as an execution attachment except there is no right of sale. Distrained property is sold at auction under arrangements made by the Ministry of Justice in agreement with the Saudi Arabian Monetary Authority to ensure the financial capability of participants. The auction may be publicised by the Execution Court through an announcement in one or more newspapers, with all expenses deducted from the proceeds of sale. The Execution Court will order an assessment of the value of assets to be sold. The distrained property may not be sold at the auction at less than the assessed value of such property. In certain cases, such as the auction of real estate, if the assessed value is not reached, the Execution Judge will order re-assessment of the value and a new auction. Sometimes several auctions may be necessary. The execution officer shall prepare a statement summarizing the sale procedures taken, the name of the purchaser and the price. Listed and other securities subject to the Capital Markets Law are sold through a licensed securities broker in accordance with procedures agreed by the Ministry of Justice and the Capital Markets Authority. The proceeds of sale of distrained property are distributed by order of the Execution Judge to the distraining creditors and those other persons considered party to the procedures. If the proceeds of sale are insufficient to repay all concerned parties, an amicable settlement may be reached which may be formalized by the Execution Court. If no such amicable settlement is reached, the Execution Court will record this as an objection, which is signed by the relevant parties and the Execution officials, and distribute the available proceeds in accordance with the relevant rules and Sharia Law. The judgment debtor may not be able to meet the debt because of his insolvency. If the debtor lodges a claim of insolvency the Execution Judge shall question the debtor and attempt to trace and identify his assets by all possible means under the Execution Law. An announcement containing the reasons for the insolvency application will be published in accordance with the Execution Regulations. If the debtor claims insolvency and the Execution Judge finds that the insolvency claim is a fraudulent one or if the debtor fails to repay the debt as a result of default or negligence on his part, the Execution Judge may refer the matter for criminal prosecution. Compared to the somewhat lengthy period it can take to obtain a judgment in the Saudi courts, the Saudi enforcement process through the Execution Court is a relatively quick process which can be used for obtaining payment under certain commercial documents and settlements that are found to constitute obligations capable of being approved for enforcement without obtaining a court judgment. Various penalties may apply if a debtor fails or delays co-operation with the execution process. Penalties include fines and imprisonment for extensive periods of time. For example, imprisonment for a period not exceeding seven years may be ordered against any person refusing to execute a final judgment issued against him or who has concealed or sold his property. Imprisonment for a period not exceeding fifteen years may be ordered in certain circumstances against any debtor proven to have committed fraud. The enforcement process is relatively fast. If there are no hearing dates set, the Execution judge proceeds through the issue and notification of orders. An execution order should normally be issued within one month of application with orders and warrants for seizure of assets, freezing of bank accounts within a further one to two months depending on the circumstances. Compared to the somewhat lengthy period it can take to obtain a judgment in the Saudi courts, the Saudi enforcement process through the Execution Court is a relatively quick process which can be used for obtaining payment under certain commercial documents and settlements that are found to constitute obligations capable of being approved for enforcement without obtaining a court judgment. The enforcement process is supported by some strong remedies and penalties to ensure the compliance of debtors. Al Tamimi & Company’s Saudi Litigation Team regularly advise on the enforcement of judgments and awards in the Execution Court and other Litigation matters. For further information please contact Omar Amery (O.Amery@tamimi.com).